REVIEW: ROCKY HANDSOME HAS LIMP, SPIRITLESS ACTION! It takes concrete storytelling not style to camouflage John Abraham's limitations. He bears the physicality of a man who could take on a dozen but his blank, pained surface cannot offer threat or evoke sympathy, writes Sukanya Verma. They may be doing it legitimately now. But they're still doing it wrong. Nishikant Kamat's Rocky Handsome, an official remake of South Korean hit The Man From Nowhere, is about a pawnbroker on a single-minded mission to rescue his seven-year-old neighbour from a bunch of neurotic gangsters engaged in a disturbing racket of drug mafia, child trafficking and organ harvesting. I watched the original many years ago, a fairly foreseeable plot in the same space as Leon: The Professional (also remade in Hindi as Bichhoo), but its blunt, brutal action is still fresh in my mind. What can be more satisfying than a silent, simmering, slow burn action hero exploding violently and systematically on screen, sparing none! Rocky Handsome is a faithful copy (right down to the bad grammar 'I Kill You') but not necessarily a good one. Much too affected and overblown in its execution to realise the attributes of its slick, sinister source, resulting in a sloppy, stupid film. It's certainly well shot though. Shanker Raman's grey, grim palette creates an air of relentless gloom and the use of Bombay Rockers track alternating between a night club brawl and frenzied dancing are the few occasions Rocky Handsome scores. The problem is Kamat's approach is steeped in stereotypes. Every single scene commits itself to hard-selling its titular hero -- emphasising on his strength (frequently flaunted six-packs), significance (plastered next to a former Indian President) and sentimentality (Shruti *sigh* Haasan). The point is driven aggressively until it begins to look he's capable of zilch in their absence. 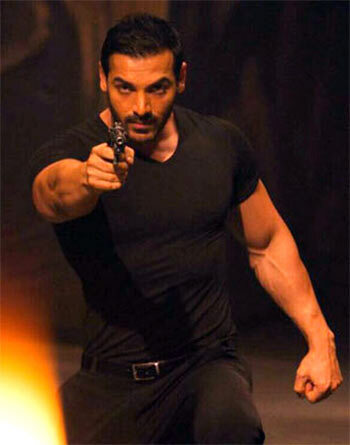 It takes concrete storytelling not style to camouflage John Abraham's limitations. He bears the physicality of a man who could take on a dozen but his blank, pained surface cannot offer threat or evoke sympathy. That his co-actors are equally inadequate hardly helps. Juggling direction duties, Kamat doubles up as a bad, bald guy along side Ted Maurya as the equally demented sibling controlling Goa's dark underbelly. While Maurya provides new insights in the art of hamming, Kamat's menace is as penetrable as the bulletproof car he's hiding in. As the narcotics cop hoping to make a breakthrough, Sharad Kelkar is the only one with some sense and semblance to where it's all heading. Model Nathalia Kaur shows up too. It's evident she's in it purely for her ability to sway hips. Even after they're cruelly tortured in a scene right before she's back on the cabaret ramp furiously shaking them in all directions. Primarily because Rocky Handsome alters the chronology of the original to accomodate, as I mentioned earlier on, its leading man's swagger. Diya Chalwad, the little girl he's jousting to protect, uncomfortably rattles off her rehearsed lines like some bored kid who'd rather stay home watching cartoons. A tender, unique friendship between two wounded souls, which forms the basis of its action-packed mission, is sorely unconvincing in Rocky Handsome. Cinema is a poignant medium where even fleeting screen time can effectively establish lingering emotionality. All it asks for are compelling performers. Rocky Handsome hasn't got any and no decibel of background score can amplify phony affection nor can clunky dialogue sounding less like conversation and more as awkward Hindi subtitles. South Korean filmmaking isn't one to hold back on violence. Gore and grace go hand in hand in its nimbly choreographed combats. Rocky Handsome disappoints on that front too. Kamath spends a sweet amount of time building up the hero's arrival on the scene and projection but as soon as it's slaughter time, the camera slips in a crazy rush to document the bloodshed. What survives is limp and spiritless.